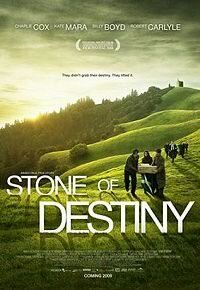 The film recounts the story of Ian Hamilton (Charlie Cox - Casanova, Stardust), a proud Scottish nationalist, who secured a prominent place in his country�s history books by bringing the Stone of Destiny back home in the fifties. Numerous myths surround this stone, which now sits in a high-security museum among swords, jewels, crowns and other Scottish royal regalia; chief among these lingering questions is whether or not the real stone was actually reclaimed. There is no doubt, however, that Hamilton�s feat struck a deep chord among Scots and provided further evidence that English colonialism was entering its bitter final days. The charismatic Cox is surrounded with a gifted cast, including Kate Mara (Brokeback Mountain), Billy Boyd (The Lord of the Rings), Robert Carlyle (The Full Monty) and Brenda Fricker (My Left Foot), all of whom lend their unique sensibilities to this heart-stirring and triumphant tale.